My F-150 is not putting out the heat that it used to. Heat level is equivalent to having the knob at the 11 o'clock position when in full hot. I also have a problem with the distribution door switching to defrost from floor when I'm going up a hill. All this started at the same time. Any suggestions? If you would use the pic below to check the vacuum lines and make sure there are no crack in the rubber hoses as well as the plastic ones. If there are cracks in the plastic ones I would get rubber hose that will go over it, using it as a splice. Let me know what you find ok. Also there is a check valve that holds vacuum check that as well. Couple questions, reference the pictures attached, so I can finish. 1. What are the two ...valves/manifolds on the firewall? 2. Is this a spare vacuum line installed in the harness? 3. Where is the reservoir and check valve? 4. Which vacuum line supplies vacuum to the Temperature blend door? I see electrical wires behind the knob. OK the vacuum comes from the intake manifold to the reservoir tank (which should be under the hood). There usually is no extra vacuum lines so I would check to see if it is broke and if there is another end to it. Now as the the vacuum solenoids if there are part numbers on it get those to me so I can look them up. I think they will be evap solenoids used for smog stuff. Solenoids not associated with the heating and cooling then. Been looking through my Haynes manual and there is no mention of the vacuum reservoir. Is it under the battery? How big is it? No they are not. I would like you to check the vacuum control for the defrost the floor and fresh air intake. Use the pic to find those. The reservior tank should be under the hood but it won't tell me where. OK thats fine. Let me know how things go. We will keep at this till we fix it. #1 White Able to supply vacuum and it held for 1 minute without loss. Ran system and supplied vacuum and fan speed increased indicating recirculate door had closed. #2 Yellow Able to supply vacuum and it held for 1 minute without loss. 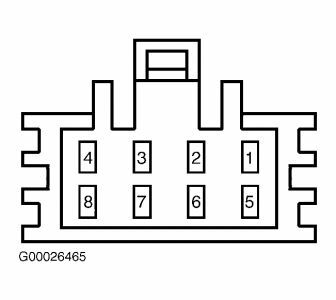 #5 Blue Able to supply vacuum and it held for 1 minute without loss. #6 Red Able to supply vacuum and it held for 1 minute without loss. Ran system in defrost mode and supplied vacuum. Air switched from Defrost to Panel. Another question. 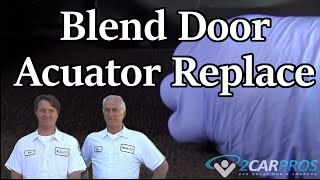 Is the temperature blend door Electrically controlled and vacuum actuated? Diagram shows a full vacuum position but doesn't show a vacuum source to it. 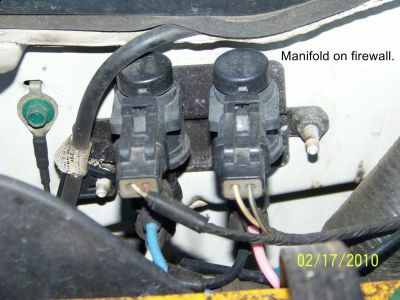 Temp switch has 3 wires coming out of the back. Going back in today and check vacuum under load while driving to verify drop of vacuum pressure and see how much. Will also try adding vacuum to blue and yellow lines to see what results are. The blend door motor is electrically controlled. So that is what I would like to test next when you are ready. Lets wait till the new reservior tank is put in. If that it no good the test will not be correct. Everything under the hood has been reinstalled. Problem still exists. Did not replace the reservoir tank but did test it. 20" vacuum from tester held for 1 hour. Know there has to be a leak somewhere. Do you know what line provides vacuum to the blend door? 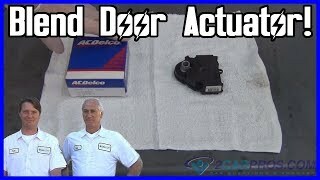 Blend door actuator is not vacuum it is electric and rotates the door. I am thinking that is the problem. Do you want to test it? Ok first if you would check fuse number 5 15amp. Now with key off disconnect the blend door motor harness. Now find the light blue wire with a pink stripe with key on is there battery voltage there? If not fix wire if so go to next step. Now set you meter on ohms and check the ohms between term number 2 and 3 (use diiagram below), with temp switch on full cool should read 3000 ohms and full warm should read 300 ohms. If this is not correct then replace the temp switch if this is correct then replace the blend door actuator. Let me know how it goes. 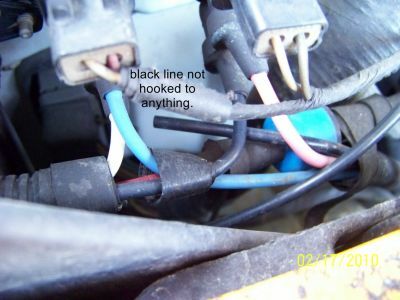 15 Amp fuse OK. Power to the blue w/pink stripe wire when power on. The switch behind my temp control knob has 3 terminals. Tested resistance on terminals 2 & 3 with Digital ohm meter set at 20K. Full hot shows.300. Full Cold shows 4.50. Replace the switch? Well full cold should be 3000 ohms and you are at 4500 ohms so I would say yes with the tests that would be correct your call. Replaced the potentiometer. Had different readings than the old one. Have more heat now but still not what it used to be. How much trouble to change the actuator? By the way, the new checkvalve fixed the problem of distributing air to the defrost when going up hills. Or could there be a partial blockage in the heater core? Hi, I have a similar problem I think. 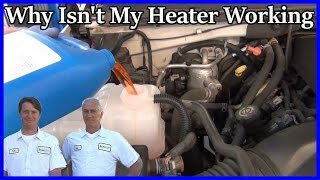 When I am driving, there is a hiss coming from the dash around the heater control area, when I come to a stop, it goes away, and is not there when I idle. I find I have less power while driving, and again, seems fine while idling. I looked under the hood, and as far as I can see, from pictures I have found on the forums, everything is connected. Before I take apart the dash, is there another way of diagnosing it? I could get a replacement heater control from the wreckers for $50, which could be an easy job, if that is the quickest solution. How do the brakes feel? It could be the brake booster making that noise. The Heater Stopped Working. It Blows Cold Air Out, But Never Gets Warm, Could It Be Something Other Than The Heater Core?